Darkness has enveloped the world; chaos reigns. Humanity fights back in the only way they know how: with forceful control. But how does one control creatures whose existence defies all logic? Martial Law introduces many new characters and actions, as well as all-new color combinations for creating chains and achieving kickers. Martial Law will also introduce the new â€œFeedâ€� mechanic which will allow players to get even more uses out of their orders. Finally Martial Law will also bring to the table a new Wound effect, sure to suprise your opponent. Other products in the "Nightfall" series. 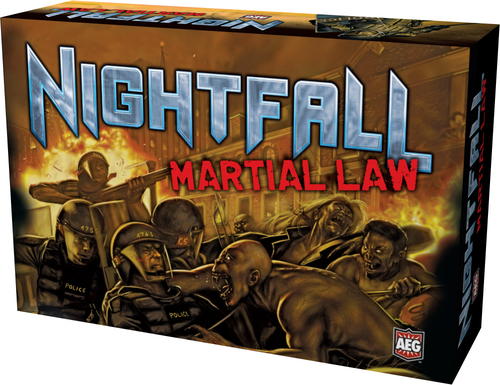 Do you like Nightfall? Get this. Doubles your draft pool with all new clan vampires and cards to help counter the various werewolves and bloodsuckers that are out to get you. One of the best and most combative deckbuilders out there. This expansion adds more cards and a couple of new mechanics. I've played the base game to the point where it is starting to feel a little similar each time, and thus Martial Law was a very welcome addition. I particularly like the way this expansion focuses on Minions and gives them a greater role to play, including giving them many new abilities.